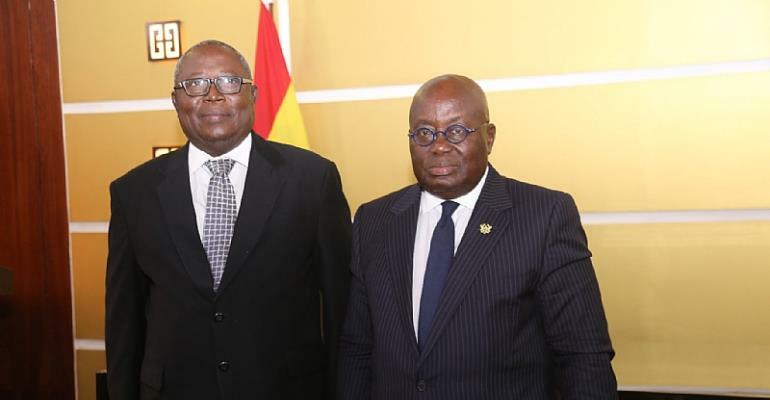 Contrary to suggestions that the Office of the Special Prosecutor may not achieve much because there’s likely to be some executive influence, President Akufo-Addo has reassured Martin Amidu, that the independence of his office will not be compromised by the executive or any other arm of government. The President gave the assurance when he swore in Mr. Amidu today [ Friday] at the Flagstaff House, as the country’s first special prosecutor. He said the office will be provided with the needed assistance to effectively deal with corruption and eliminate same. “I want to assure him that not only will the Executive including the Attorney General respects scrupulously the independence of his office, but will also provide him with whatever assistance is required to enable him to discharge his high duties effectively in the interest of the Ghanaian people,” he said. The president reiterated that, the office of the Special Prosecutor will work line in with the citizens’ wishes to fighting corruption by discharging its duty without fear or favour. “The establishment of this office is for a high purpose and must not under any circumstance be used as an avenue for persecution and acts of vengeance, the office will be required to do justice to all manner of persons,” he said. He congratulated him on his appointment and wished him well for the task ahead. “I congratulate him fully on his deserved appointment and wish him God's guidance in the effort he will undoubtedly be making to try to instill integrity and accountability in the governance of our country,” he said. “I have given Mr. President my word of honour that I will discharge the duties of the burdensome you have entrusted to my care with similar integrity and honour with your support. Mr. President, I want to assure you that the propaganda about witch-hunting will not daunt me from prosecuting all corruption crimes without reference to political considerations…I will treat crime as crime and nothing else,” Mr. Amidu assured after he was sworn in. “I wish the public to know that nobody has served me personally with any writ or statement of case or injunction challenging my nomination, approval and appointment so as to restrain me from accepting this appointment,” he added. The setting up of the office of the Special Prosecutor was one of the key campaign promises made by President Akufo-Addo ahead of his election victory in 2016, and it is aimed at tackling corruption effectively. The Special Prosecutor's office will be independent of the Executive, which observers believe will allow it to adequately deal with corruption-related issues which have plagued past governments. The office of the Special Prosecutor has the mandate to investigate and prosecute cases of alleged corruption under the Public Procurement Act 203 Act 63 and other corruption-related offences implicating public officers, political office holders and their accomplices in the public sector. The Prosecutor is also be mandated to trace and recover the proceeds of corruption. The former Attorney General received unanimous approval from Parliament earlier this week, despite a pending suit at the Supreme Court over his eligibility for the position. The post Your independence is assured – Nana Addo tells Amidu appeared first on Ghana News .